Hotels close to Troyan Monastery, Bulgaria. The Troyan Monastery is one of the biggest monasteries in Bulgaria. It was founded in the XVI century by monks from the Mount Athos, as manuscripts declare. The monastery is located in a beautiful area, close to Oreshak Village and on the bank of Cherni Osam River. The distance to Troyan Town is 10 km. Visitors can observe the wall-paintings in the monastery's church made by the famous craftsman Zachary Zograf, including a self-portrait. 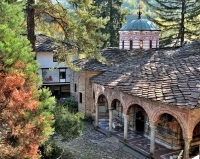 In the beginning of the XVIII century a church school was founded in the Troyan Monastery. Another curious fact is that the Bulgarian revolutioner Vasil Levski formed here a revolutionary committee, although the Monastery did not participate directly into the April Uprising because at that time Turkish military groups occupied the place. The Bulgarian Patriarch Maxim was a novice monk in the Troyan Monastery in his young years and was buried here in November 2012. There are a lot of accommodation options in the surrounding areas – from family guests houses to more luxury hotels in Troyan. If you do not want to spend the night in the town, the villages around the Troyan Monastery also offer accommodation – Oreshak, Cherni Osam, Patreshko, Skandalo and Velchevo. There is a variety of 3-star hotels, as wells as separate rooms in villas and guest houses.